HTET for appointment as a teacher, held by the Board of School Education, Haryana. Interested candidates go through the official website of Haryana School Education Board www.htetonline.com and read the Guidelines/ Instructions to fill application form. Starting date for HTET exam 2017 online Application submission is 01-11-2017 and last date is 10-11-2017. Haryana TET Exam will be held in the month of December-2017. 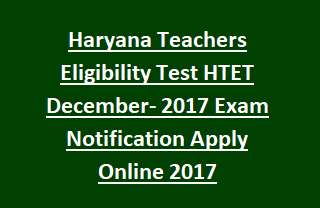 For Haryana Teachers Eligibility Test Application form details, Admit Card details, Exam dates, Syllabus & Pattern, Application fee and other updates, please go through the HTET notification. Senior Secondary with 50% marks or equivalent or 2 years Diploma in Elementary Education/ Special Education or 4 years Bachelor of Elementary Education B.El.Ed. B.A/ B.Com and two year Diploma in Elementary Education or B.Ed (1 year) or Senior Secondary Education with 4 years B.El.Ed or B.A/ B.Com with one year B.Ed Special Education or Senior Secondary Education with 4 years BA/ B.Com Ed. Post Graduate Degree with 50% marks in concerned subject and B.Ed from recognized university. Please go through the HTET Notification for full details. HTET Exam will be conducted in Conventional Type (Pen Paper based). Candidate should appear 2hrs before the commencement of Examination. Haryana TET Exam consists of total 150 MCQ type questions and the time duration is 2 ½ hrs. For Scheduled Castes and Physically Challenged/ Differently Abled candidates is 55% i.e 82 marks. Anywhere in Haryana state as well as outside of Haryana. HTET Exam Admit Cards available from 15-12-2017. Interested candidates go through the official website of Haryana School Education Board www.htetonline.com. Read the Guidelines/ Instructions carefully and proceed to fill the application. Online submission of Haryana TET Applications starts from 01-11-2017 and closed on 10-11-2017. Candidates shall be allowed to make correction of applications through online from 11-11-2017 and 12-11-2017.